Businesses that have a variety of ways to accept payments from customers are probably going to find they get paid on time more often with less fuss. Here, Andrew Byrne, COO of myPOS Europe, looks at the benefits of bank-free payment technology. A plumber’s nightmare in the flesh: you go over to service a faulty boiler that’s blown its top, and once you have solved it and it’s time to pay the piper, the customer reaches for their wallet and horror sinks into your stomach as their cash seems to have mysteriously disappeared. To many this might sound like a joke, but it’s definitely one that makes uncomfortable listening for many plumbing and HVAC SMEs. Things like this can add to the cash flow strain on a business, and with 50% of SMEs operating in the red on a regular basis according to the Small Business Index, it can hurt prospects of future growth if unchecked. Even more worryingly, recent research from business insights firm Dun and Bradstreet has shown that the very existence of almost 60% of SMEs they surveyed was threatened decisively by the problem of late payments. Let alone handling things like trade accounts and overseas transactions, which can throw even the most carefully planned financial planning into disarray. And this is being amplified by the increasing cashlessness of the societies we’re living in. Sweden is reportedly around 99% cashless now, and debit card payments overtook cash in the UK for the first time last year. As such, additional strain can be piled onto businesses not in touch with the way things are headed. But new payment technologies offer the opportunity to bypass such troubles, and they do so in two fundamental ways. In the first instance, the arrival of new tech innovations allows SMEs and individuals to affordably process payments immediately, with card payment processing facilitated by a handset bought with a one-off payment. Choosing to use what are now called point of sales systems (POS) allows businesses to bypass banks in the interests of convenience, speed and cost. In doing so, plumbers and businesses can get paid instantly instead of waiting up to a week to receive their money, allowing them to plan for the future more effectively. 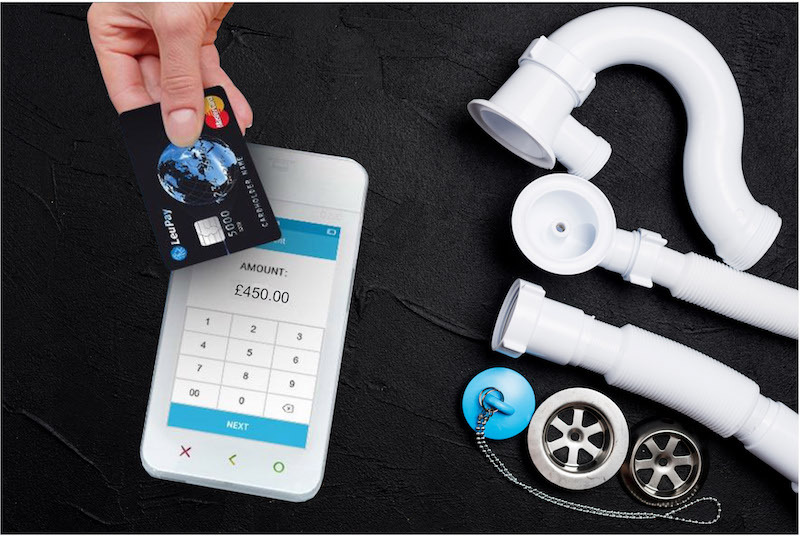 This opportunity also offers plumbers the chance to supply customers with an additional payment method who might not have physical cash on them at any given time – but who do want to pay their dues. As the rise of the gig economy and increasing rates of self-employment make us all entrepreneurs, comprehensiveness of service will be key to differentiate yourself clearly amidst the sea of competing plumbers and SMEs in the market. Taking a wider view, the second point is that the growth of e-commerce, declining fortunes of the high-street and increasing closures of bank branches have created changes in the way we now shop, pointing to a more demanding customer as their expectations have grown. Legislation will also accelerate this, with a recent EU Directive getting rid of the payment processing fees that consumers used to pay, encouraging more people to go cashless. Therefore sole traders and SMEs need to make smoothing out the cashless payments process a priority, as leaving it as it is could throw up a question mark on your attitude towards customer service. Happily however, its clear the world is accelerating through a period of disruption like never before, providing opportunity for those who exploit the niches opened up in the market by embracing technology to deliver excellent service. Ultimately, with a little bit of effort that nightmare can definitively be made to slip away. By embracing the cashless society and POS systems, you’ll be ready to face the future, here in the present.